Last week, I joined Dylan from Man I Love Films, Danny from Can't Stop the Movies, Alex from And So It Begins..., and Sam from Duke and the Movies for the latest episode of the LAMBcast. 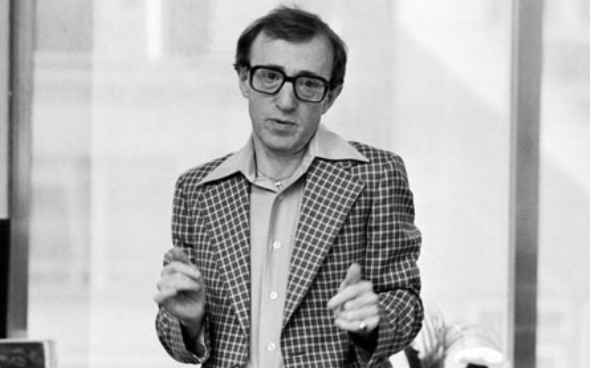 Our topic was the career of Woody Allen, who's directed more than 40 films during a career that goes back to the 1960s. He's received plenty of acclaim, but some critics have cited the law of diminishing returns during his recent work. Did the panel agree with this claim? It seems unlikely given the success of Midnight in Paris this year. Instead of simply discussing each film, we covered the key themes of Allen's work and his unique perspective on his movies. It was a fun, informative conversation that's encouraged me to catch up with some holes in my Allen viewing background. If you're a fan or just getting acclimated with his career, this podcast is definitely worth your time. Check out this episode and let me know what you think! Awesome episode. Easily the most interesting single episode of the Lambcast I have listened to so far and all of you were very well versed on Woody. Thanks Joel! It was a lot of fun to record, especially since everyone knew a lot about Woody Allen and had plenty to say.